Montezuma became ruler of the Aztec Empire in 1502. Under his rule the practice of human sacrifice expanded. At the empires peak he ruled between 15 and 20 million people. Before the Spaniards arrived Montezuma was known for his bravery and successful military campaigns against the Mayans and the Mixtec. Under his rule the practice of human sacrifice expanded. At the time of the Spanish Conquest, Montezuma was forty years old. The Spaniards described him as slender, of average height, and somewhat muscular in appearance. Montezuma had dozens of domestic servants, and did almost nothing for himself. In addition, he had two legitimate wives and hundreds of mistresses. Montezuma led an incredibly luxurious lifestyle. Thirty dishes were prepared for each meal. His favorites included turkey, pheasant, partridge, quail. duck, rabbit, venison, and wild boar. While Montezuma ate he was entertained by small humpback jesters who told him witty sayings and sang and danced. He also maintained groups of stilt walkers, acrobats, musicians, and an assortment of dance troupes. Eyewitnesses reported that Montezuma had two houses filled with arms, and that many weapons were adorned in gold and jewels. Montezuma also had a palace aviary that contained every color of feather imaginable. Feathers were plucked and harvested. The green quetzals were the highest prized and used only by royalty. The rich green feathers were used for the royal litter, and royal clothing. Also, Montezuma maintained a large collection of venomous snakes and his own zoo of carnivorous animals. Montezuma employed a vast amount of gilded craftsmen. He maintained gold and silversmiths, people who only worked with feathers, painters, and sculptors. He also maintained a staff of stone cutters, masons, and carpenters just for the needs of the palace. The gardens of Montezuma’s palace were filled with ponds, flowers, and scented trees. It was a town within a town. Montezuma’s downfall happened quickly. At the beginning of the sixteenth century a series on natural events spooked the Aztecs. First, a comet streaked across the sky in 1509. Next, lightning that was unaccompanied by thunder struck the towers of the temple that housed the Aztec principle god Huitzilopotchli. The bolt burst the tower into flames. It was destroyed. Then, just as the Aztecs were completely spooked and expecting the return of a god, they heard the stories of castles floating on the water, and enormous beasts with four legs carrying bearded warriors. By the time the Spaniards arrived in Tenochtitlan the Aztecs had begun calling them Teules. Teules was what they called their religious idols. The Spaniards, in 1519, were led by the fearless Cortes. Cortes was searching for riches. Montezuma had his ambassadors met Cortes on the road and they offered him gold and textiles if he and his men would leave and go home. Instead, Cortes went crazy when he saw all the gold. At that time, all of the money in Spain was made out of gold and silver. Nothing could stop Cortes when he realized that they were on the heals of a great and wealthy empire. Then, to make things even worse , Montezuma invited Cortes and his men stay in the palace of his deceased father Axayaca. Axayaca’s treasure was still in the palace, hidden behind a recently cemented wall, and it was quickly discovered by Cortes and his men. Shortly afterward a group of Cortes’s men were killed by Aztecs, and the Spaniards started to panic. Cortes decided to do something desperate, he kidnapped Montezuma. Everything went smoothly. 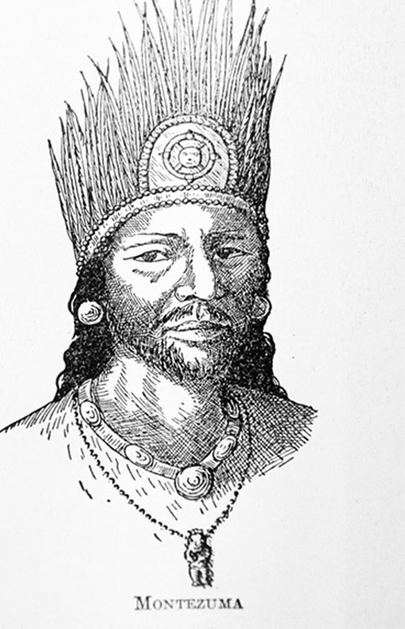 Cortes allowed Montezuma to lead a comfortable life, complete with wives, and servants. Then, while Cortes was away from Tenochtitlan, he left Pedro de Alvarado in charge. During an Aztec celebration of drinking, dancing, and singing, Alvardo attacked killing hundreds of Aztecs. In a short time the Spaniards were besieged by thousands of mourners looking for justice. Days later Cortes entered Tenochtitlan and rode into an ambush. The entire city was at war. In order to calm the Aztecs he had Montezuma go to a rooftop to speak to the Aztecs and tell them that the Spaniards would leave the city, but no one believed Montezuma. As a result Montezuma was stoned to death by his own people. As the story goes he was struck by a stone in the temple and died three days later. However, many believe that he was killed by Cortes.